Surprisingly perhaps that’s where the world’s largest rivers are. Extracting this humidity from the atmosphere is not necessarily that difficult. 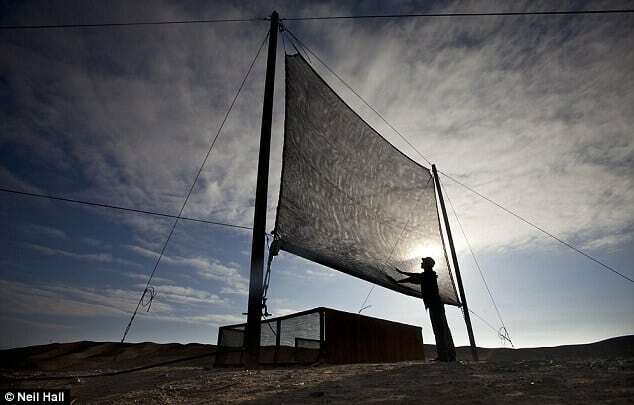 In the Atacama Desert in South America there are whole towns which garner their water supply from dew/fog screens which harvest humidity http://www.windows2universe.org/vocals/water_clouds.html . Pliny the Elder wrote of desert island (Hiero in the Canaries) where the natives were able to catch all their water requirements from dew falling on a ‘fountain tree’ http://chestofbooks.com/reference/A-Library-Of-Wonders-And-Curiosities/Fountain-Trees.html#.VXUS2Ub0ncs . There ARE commercial possibilities. Greenhouses in Oman are watered entirely by condensation systems (http://en.wikipedia.org/wiki/Atmospheric_water_generator) . This chap has a wonderful system: https://www.youtube.com/watch?feature=player_embedded&v=cXe-4XE2QVI which won the Dyson Award. Keeping yourself alive by harvesting the water from dew therefore, ought not be too hard. Anywhere there is vegetation (at least) and any appreciable humidity (even in deserts) dew forms all night. It can be mopped up with a garment and the results squeezed into a suitable container and later boiled to kill any bacteria accidentally included. It is possible to harvest many litres per night (!) Attaching the garment to a handle, or dragging it with a string will make the work easier.